Congratulations -I think just getting to Z was an achievement but you did so much more….500 blogs! Wow, I’m impressed, and to use that as an opportunity to reflect on blog presentation as well. Thanks Cass. It was a lot of work, but a lot of fun. I like the golf photo that you posted for your reflections. It’s so cute and represents a champion! Congrats on completing the challenge with new insight on your writing style, more familiarity with your blogging platform (WordPress), confidence in your work and motivation for being able to finish such a huge task. Thank Nicole. I love the photo,too. 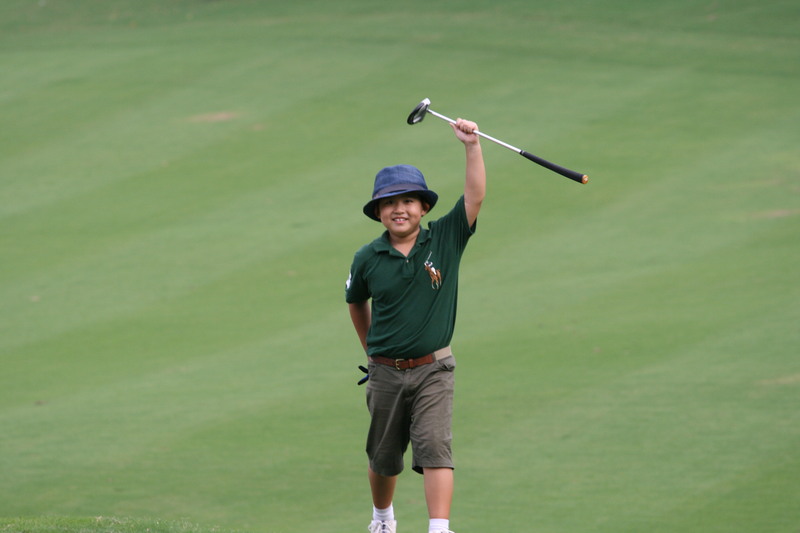 This kid is one of my juniors at the golf academy and he is so motivated to be the best golf he can be at such a young age. I wish I had found my passion at that age. A great post on your A-Z experience and I loved the line, “Not like a cult, more like a play group.” Ha ha. Thanks Lily. MCA was the real deal. I’m with you on numbers 3 and 4 – I’ve definitely enjoyed connecting with and learning from fellow bloggers. Yeah. That’s been the best part. Way to go finishing the challenge Sydney, Thanks for stopping by my blog and leaving a comment. I’m sorry we didn’t meet during the challenge, I feel badly that so many great bloggers out there that I just didn’t get to meet. Congrats on your Versatile Blogger Award! Getting awards is so much fun…. Thanks Jen. Awards are fun. I didn’t think about it until you said it, but I also liked blogging with others. It make me feel like part of a larger community, something I frequently think about and sometimes write about on my blog. Living in China I am always trying to find ways to stay connect to basically life outside of China. This community is so generous and so supportive. It has been nice. Congratulation on finishing the challenge. I didn’t visit all blogs during the challenge but, cross my heart, I’m visiting every single one with reflections post! Hi Evalina. Thanks for stopping by. Congrats to you as well for finishing the A to Z challenge. It was so much fun. Hopefully you were able to use one of my banners/badges for the Challenge, had as much fun designing them as seeing them around the blog world. Thanks Jeremy. I had a blast on the challenge. Thanks to you and the team for being such great hosts. And, the badges were really cool. I used it as my desk wallpaper during the challenge as well to stay focused. I am just as happy to be a part of this community – great topic you had for the Challenge. These challenges are a great way to learn all your features. Hope to see you in the next year A – Z!! I learned so much from this years challenge. I am excited to do it again, next year.